Bigger, faster, stronger! the latest ball in the Gator skin family is designed specifically for teen and adult dodgeball games and leagues. At 8.3 inch diameter, it's our biggest Gator skin ball ever! high-density foam core and a new proprietary bonding layer, so you can throw it faster and farther than our other dodgeballs. It won't hurt adults and is our most durable ball yet! each ball weighs about 220 grams. The foam density is 35 kg/M3. Non-sting coating is a proprietary polyurethane. We're so sure that our Gator skin balls are the highest-quality coated foam balls on the market! the tactile, non-sting coating makes them easy to grip, and the coating is so durable, they're virtually tear-proof! no more red marks from the stinging hit of a vinyl- coated or rubber ball, so everyone can play at ease and gain confidence. That means more fun during more activities. Our premium Gator skin balls are simply your best choice. Gator skin is a registered trademark of S&S Worldwide. Any use of this trademark without express written Consent from S&S Worldwide is strictly prohibited. 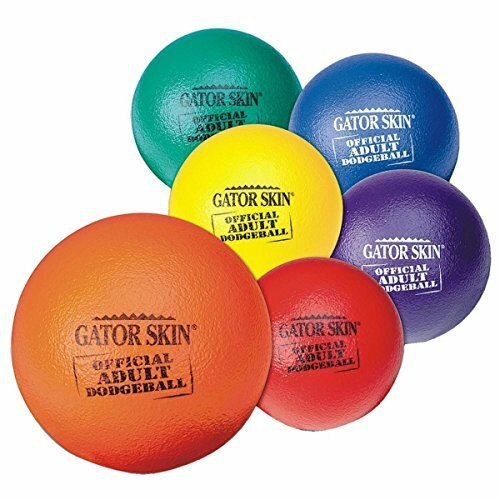 Gator skin is the original coated foam ball enjoyed by millions of satisfied customers.